Come hear from leading industry horse experts on performance and nutrition! Free to attend! Enter to win one ton of Purina Horse Feed! Plenty of door prizes. Need a new saddle? Tired of that pile of bits in your tack room? Come shop and swap at Purina Tack Swap! Don’t miss out! 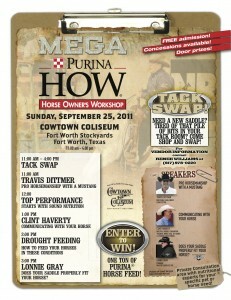 Mark your calendars for September 25th, 11:00 A.M. to 4:00 P.M. at the Cowtown Coliseum Fort Worth Stockyards. This entry was posted on Thursday, August 25th, 2011 at 8:14 pm	and is filed under Events. You can follow any responses to this entry through the RSS 2.0 feed. Both comments and pings are currently closed.